The Pro Truck Nationals (PTN) series made its first ever trip to Willard Hammond’s beautiful Newtown Dragway in Newtown, VA on the first weekend of August. This track is literally the field of dreams set in the woods of rural Central Virginia. Willard opened Newtown Dragway in 1999 using the best practices of other sand tracks, asphalt drag strips, and even tractor pull arenas in mind. The finished product is an incredible sand drag facility that is both racer and spectator friendly with a list of premium amenities a mile long. Unfortunately, on this weekend Mother Nature was not on the side of the racers. A dismal forecast hurt the racer and spectator turnout, but fortunately after a damp day of racing on Friday, the Saturday weather was dry and some great racing transpired under cloudy skies. Let’s take a look at the action. The 2nd Annual Sandstorm is coming up this weekend, August 15-17 at Albany Sand Drags in Albany, Oregon. This is looking to be a great race in the Northwest with racers from across the Western region making the haul to Oregon. NSDN will be on-site with coverage of this event. The Sandstorm promoters have released the Event Schedule as well as Race Flyer with all sponsors listed. Click “Read More” to view the schedule & flyer. Avenal Sand Drags in Avenal, CA is preparing for their 2014 Fall Nationals on October 10-12. This will be a three day event. The event flyer has been released for this race. Click “Read More” to view the flyer. 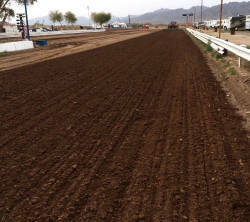 Dome Valley Raceway in Wellton, AZ is currently undergoing a series of upgrades to their top notch sand drag racing facility. Track owner Ernesto Juarez is overseeing the project. For the time being, Dome Valley Raceway is in a holding pattern as the upgrades and improvements are taking place. Ernesto wanted to pass along that contrary to rumors Dome Valley is still alive & will be open for sand drag racing in the future. Keep an eye out here for announcements on the return to racing at Dome Valley.